THE CIRCUS LIQUORS REDEVELOPMENT PLAN. THE REDEVELOPMENT PLAN, AS PUSHED THROUGH BY THE TOWNSHIP COMMITTEE, LACKS VISION. IT IS DESTRUCTIVE OVERDEVELOPMENT. MIDDLETOWN DESERVES BETTER. • FUND THE FIGHT. NOW! • MARK YOUR CALENDAR. ATTEND APRIL 17 MEETING. READ & DOWNLOAD THE ARCHITECTURE SITE REVIEW EXCERPT. ​It's THE ONLY WAY YOU CAN BE PREPARED WITH QUESTIONS TO ASK, OR TO FOLLOW ALONG, PARTICIPATE, AND UNDERSTAND WHAT'S BEING DECIDED ON. ​SHOW UP. BRING YOUR NEIGHBORS. ​The Township is counting on resident complacency. Middletown Planning Board Technical Review. The entire document. 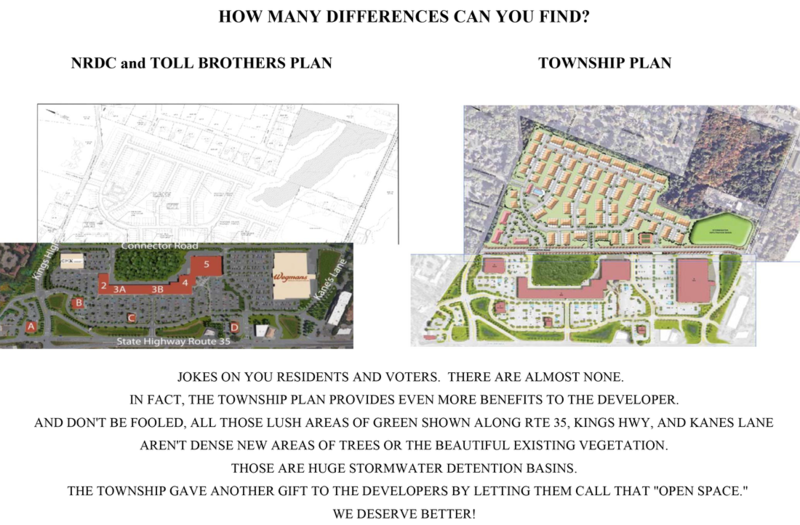 ​The Circus Liquors Redevelopment Plan (CLRP) application consists of 350 residential units, a Wegmans, a dine-in movie theater, and 20-30 strip mall stores on +118 acres. The plan is absurdly large, (larger than the Monmouth Mall), for an already congested Route 35 frontage location. The poorly planned road reconfigurations will not alleviate the enormous amounts of traffic coming to Route 35 and through our neighborhoods. All of which equates to lower property values and lowered quality of life. We want the CLRP project to be less dense, which in turn will cut down on traffic. We want the project to be in keeping with Middletown's Master Plan. As CLRP stands now it is not appropriate for the area. Minding Middletown LLC, the parent company of Stop Village 35, has filed a lawsuit challenging the Township’s “area in need of redevelopment” designation. This was done on the advice of our Legal team as the best way to stay involved in the outcome of the project. It’s the necessary next step in our efforts to fight overdevelopment in Middletown. 1. 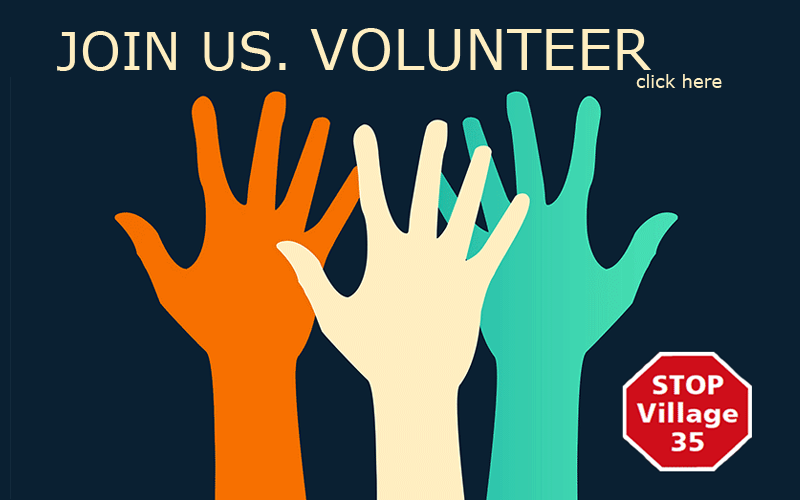 As major stakeholders, residents and taxpayers of Middletown, we want a voice in what's being developed in our Town. 2. Area in need of redevelopment designation enables the Township and the developers to negotiate a PILOT (Payment in Lieu Of Taxes) agreement which is a scheme to encourage development. The developer does not pay market rate taxes (like us home owners or any other commercial business) and the Township does not have to pay taxes toward Education (which is 62% of home owner taxes in Middletown). In other words, with PILOT, neither the Township nor Developers pay their fair share of taxes, in this case for prime real estate that did not need redevelopment incentive, it already had development contracts in place before the Town pushed through the designation! Sadly, the only way for tax-paying residents to be heard and to be considered stakeholders in their town is to have Legal representation. THIS PLAN WITH ITS NEW NAME IS AS MUCH OF A CIRCUS AS THE ORIGINAL VILLAGE 35 PLAN. ​MAKE THE TOWNSHIP REMEMBER THEY WORK FOR YOU. The Planning Board site plan review begins with the Commercial portion of the redevelopment tract. The Residential portion of the plan, developed by Toll Brothers, will be heard after the Commercial plan is reviewed. NRDC. 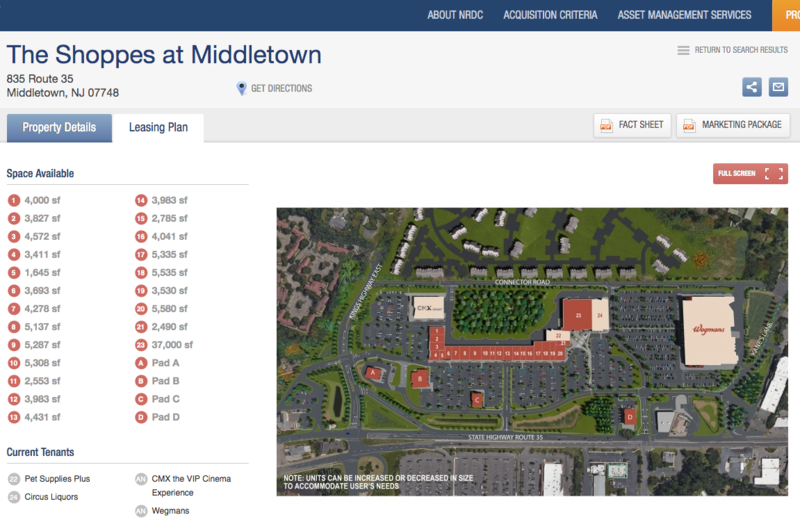 SHOPPES AT MIDDLETOWN REDEVELOPMENT PLAN. APRIL 2019. NRDC's newest leasing plan. a block of retail space (2-5), that could be ANOTHER BIG BOX STORE, or a DEAD MALL in the making. LARGER THAN THE MONMOUTH MALL. 1/2 MILE FRONTAGE ON RT 35. 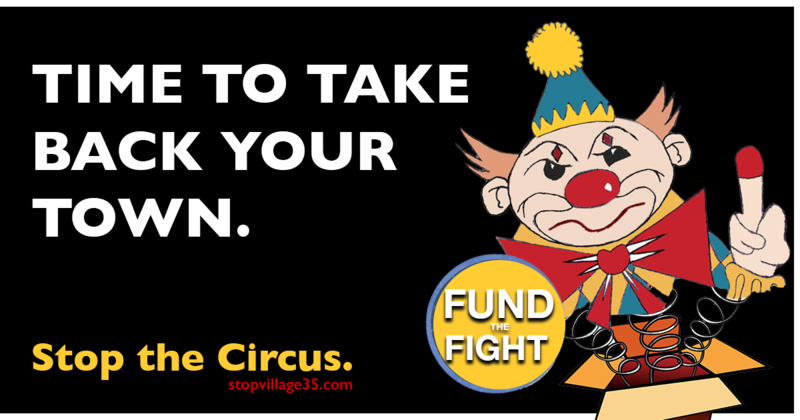 • Register to oppose the Circus Liquors Redevelopment Plan, formerly known as Village 35. • Our Facebook Page is the best source for news alerts. Like & Follow us here. 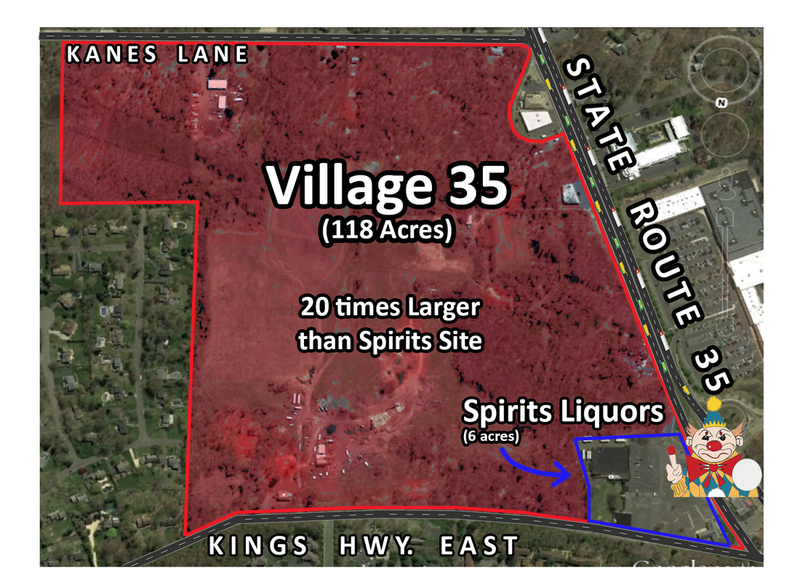 Many residents are unaware of the Village 35 proposal. It's important the Developers & Planning Board know we are not going to sit idle and let the destruction of our community pass without a fight. SPEAK OUT: find the contacts needed to write letters, call, and email. Let's get attention & make a lot of loud noise. ​April 17. Planning Board Meeting, 6:30pm. April 10. Mayor's Open Office. 5:30-7:30pm.